There are a ton of Android clones on the market. You can find cheap, Mediatek-based clones of all popular brands of Android phones. These phones may appear similar to the real version, though not always. 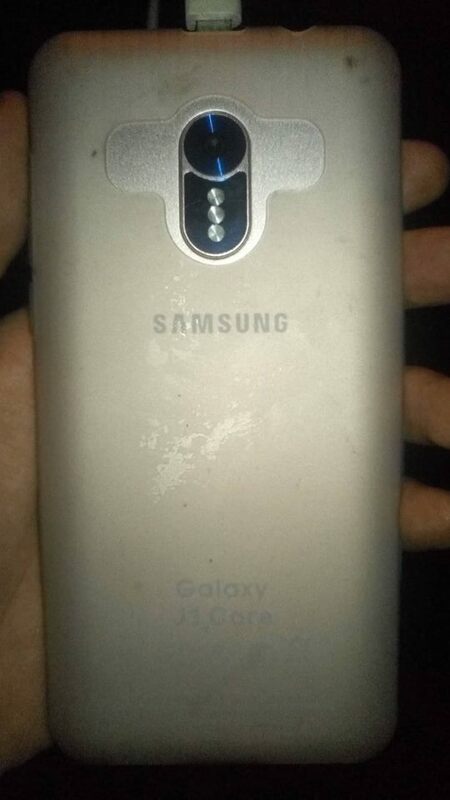 Samsung Galaxy J1 clone with fake triple lens camera. For example, for this guide we are working with a Samsung Galaxy J1 clone that appears to have a triple rear camera – until you pop off the back, and see that the triple lenses are fake! Not to mention Samsung doesn’t even make the J1 with triple camera lens. If it isn’t immediately obvious a phone is fake from the hardware, the firmware will almost always give it away. When you check Settings > About Phone > Firmware, and its some weird version number that doesn’t match the official firmware build at all. If you soft-brick a clone phone, of course you can’t flash the firmware for the phone it is trying to be – you need the exact firmware the cloners used. 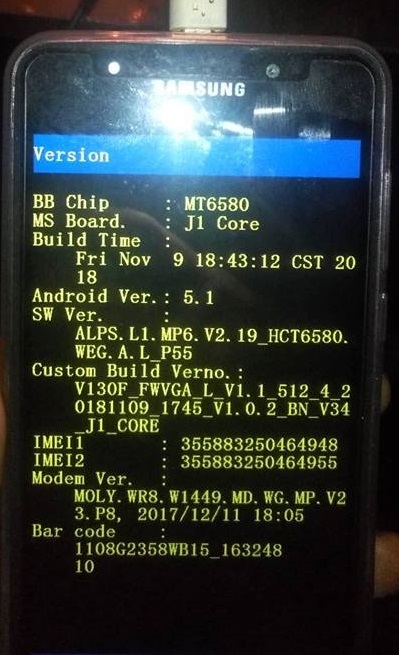 This is typically generic Mediatek firmware, modified with UI elements (like a Samsung boot logo on our fake J1). In this Samsung J1 clone, we are not able to boot into Recovery Mode – It shows the red triangle error. We can get into Fastboot Mode, but ‘fastboot flash recovery recovery.img’ and ‘fastboot boot recovery.img’ only produce failed messages. We are able to get into a “testing” menu by holding Volume Down + Power during boot. Many MTK devices have this feature, so doubtlessly your clone phone does as well, its just a matter of figuring out the correct button combination. In the “testing” menu, we looked in “Software”. This produced the SoC (MT6580), and the software version – ALPS.L1.MP6.V2.19_HCT6580. Below that is “Custom Build Verno.”, “V130F_FWVGA_L_V1.1_512_4_20181109_1745_V1.0.2_BN_V34_J1_CORE”, which is simply the cloner’s version of the software, how they modified it. This is what we want, because the cloners likely modified the original firmware to work with whatever hardware was thrown into the clone device. If you cannot find the custom build firmware, you may be able to flash the generic software version firmware. By googling “V130F_FWVGA_L_V1.1_512_4_20181109_1745_V1.0.2_BN_V34_J1_CORE”, we found several download pages on rather shady Android forums. Not surprising, since we are looking for “original” firmware for clone devices. We proceed with the download. Since these clones are typically Mediatek-based, we are of course going to use SP Flash Tool. This software allows flashing of custom firmware / ROMs and custom recoveries on Mediatek devices. So we download SP Flash Tool and launch it. Now we extract the firmware we downloaded, and browse through the subfolders. You should see several .txt files like “MT6580_Android_scatter.txt” in our case. In SP Flash Tool, click “scatter-Loading” and choose the xxx_scatter.txt file from the firmware folder you downloaded. Check the “Download Only” box. Now turn off your phone and pull out the battery for a few seconds (if the battery is removable). Then put the battery back in, but do not turn your phone on. Click the “Download” button in SP Flash Tool, and then connect your phone to your PC via USB. SP Flash Tool will begin flashing the firmware. When its done, a green circle will be displayed. You should now be able to boot the device normally. What is: A Bricked Phone?